Lynn Makor is a school psychology consultant for the NC Department of Public Instruction and the Carolina Institute for Developmental Disabilities. She addressed the House Select Committee on School Safety's Student Health Subcommittee. School psychologists want legislators to know that there aren't enough of them to go around. A subcommittee of the House Select School Safety Committee met Monday to consider improvements to school mental health services. One of the resounding recommendations from school pyschologists and counselors: they need more support. School counselors provide a frontline of mental health support for students, but they also serve in many academic roles, like teaching health or career-related classes and advising high schoolers in college admissions. School psychologists are meant to provide interventions for at-risk students and give more intensive mental health support, but they told legislators they often get stretched thin serving multiple schools. Representatives from the NC School Psychology Association and the NC School Counselor Association say that school counselors, nurses, social workers and psychologists are meant to provide a multi-tiered system of support to students. But right now, they say they're doing the best they can with a limited capacity. "Currently, a lot of our school pyschologists don't have an opportunity to provide comprehensive services due to ratios," said Heather Lynch Boling, president of the North Carolina School Psychology Association. The recommended ratio of school psychologists to students is 1 to 700. In North Carolina, the actual ratio is 1 psychologist for every 2,100 students. The ratio of school counselors to students is 1 to 386 and the recommended ratio is 1 to 250. School psychologists are stretched the farthest in The Sandhills, with one psychologist for every 2,400 students. The ratio is the lowest in the western part of the state with 1 for every 1,351 students. There are 74 vacancies for school psychologists across the state. Many schools share a school psychologist, and 12 districts are without a psychologist altogether. Lynn Makor is a school psychology consultant for the Department of Public Instruction. She says she'd like to see student mental health services improve, but that shortage is holding back progress. "We have to be realistic and recognize that we're three times the recommended ratio, and so any changes are not going to happen overnight," Makor said. Low pay is part of the problem. 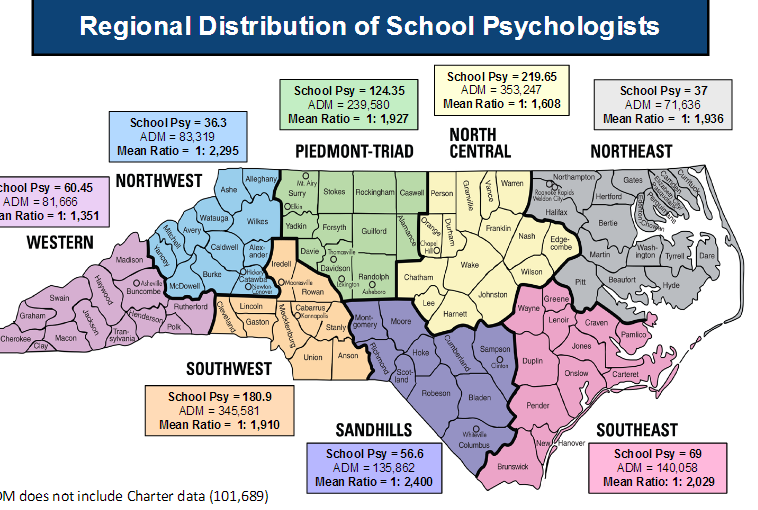 The salary range for school psychologists in North Carolina is $43,390 to $61,920. The highest paid school psychologist in North Carolina is making less than the national median salary for the position, at $63,000. Makor says that makes it easier for neighboring states to recruit psychologists from North Carolina. Keeping kids safe from violence is central to all of this talk about mental health services, or as Makor says, "keeping healthy kids healthy." Experts who spoke at the committee meeting emphasized that early intervention for troubled kids is good prevention against school violence. During lunchtime, school counselor Kim Hall takes a break from her desk and roams the hallways of Providence Grove High School. On her five-minute walk, she encourages a senior to apply to UNC, consoles a student dealing with a scratchy throat and reminds a young teenager to see a teacher. “We try to make sure that we’re accessible to students during their free times,” Hall says. Hall has been a school counselor for 29 years. She says she tries to make more time for students as her clerical duties have grown over the years.